Is This Cat Judging You? There’s a new cat with an attitude in town and his name is Pompous Albert. Pompous Albert is a seven-year old Selkirk Rex. 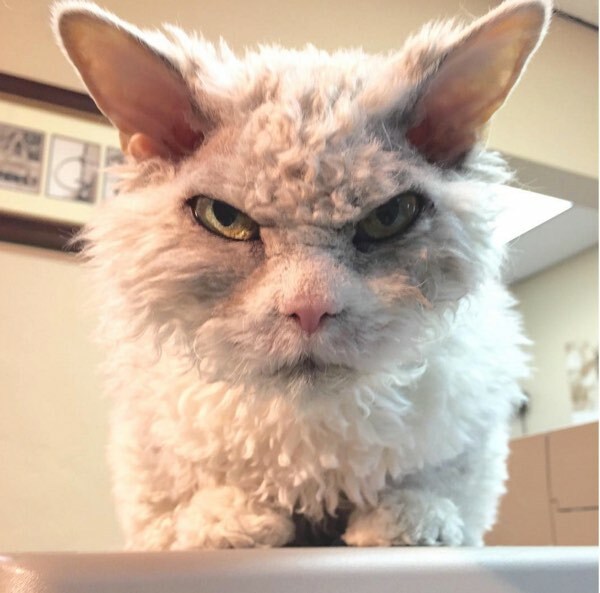 Susan Singleton, his human, says that Albert didn’t gain his expressive face with age, he’s looked like this since he was a kitten. He has big yellow eyes that look as if they’ve been ringed with heavy eyeliner, and his unmistakable glare commands the attention of everyone he meets. Apparently some people have asked if Pompous Albert is a real cat! Albert’s unusual looks have gained him over 23,000 followers on Facebook and a staggering 90,000 on Instagram. Albert was named after Albert Einstein and as you can see there is a similarity. Apparently some people have asked if Pompous Albert is a real cat! You people are back, aren't you? If I don't look up- maybe it won't be true. But he’s a real softie at heart! Head Rush later, or as I like to call it Orthostatic hypotension.